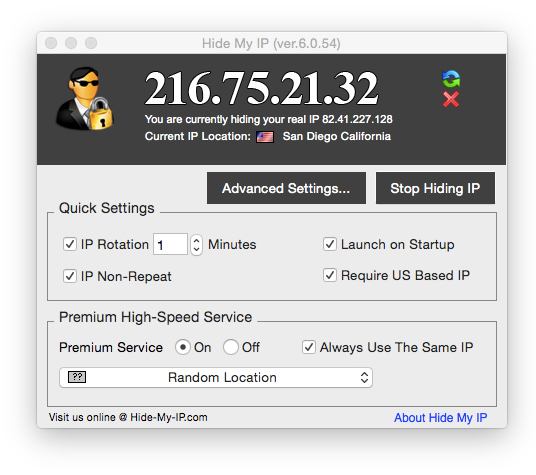 Access blocked content and protect your IP with Hide My IP for Mac. Enjoy private web surfing with secure OpenVPN technology at the click of a button. Protect your Internet traffic, bypass censorship, and hide your IP address. Provides end-to-end enctyption and privacy between your Mac and any website or online service. Unblock and access TV, movie, news, and social sites like Youtube, Facebook, Netflix, BBC iPlayer, and Hulu. Thousands of IPs to choose from in more than 95 locations worldwide. Advanced features include Discard IP list and automatic IP rotation. Supports all applications and browsers such as Safari, Chrome and FireFox. Try and download for free. New locations, bug fixes, 95 VPN IP locations available.